Kids who are involved in contact sports should definitely invest in a mouthguard for practice and games. Baby teeth are important to preserve because they create space for permanent teeth later on. Losing teeth can also result in bone loss and structural imbalances later on. In sports, accidents can’t always be prevented. If your child is involved in an accident, like an elbow to the face or ball to the mouth, the right equipment can prevent a major injury. Kids and teens who have braces are at a higher risk of injury during contact sports because their metal braces could break and scratch tissue in the mouth if there is an accident. Dentists and orthodontists recommend children using orthodontic appliances to get a custom-fitted mouthguard for safety. To learn more about dental safety and dental emergencies, head over to our pediatric dentist’s guide for parents below. 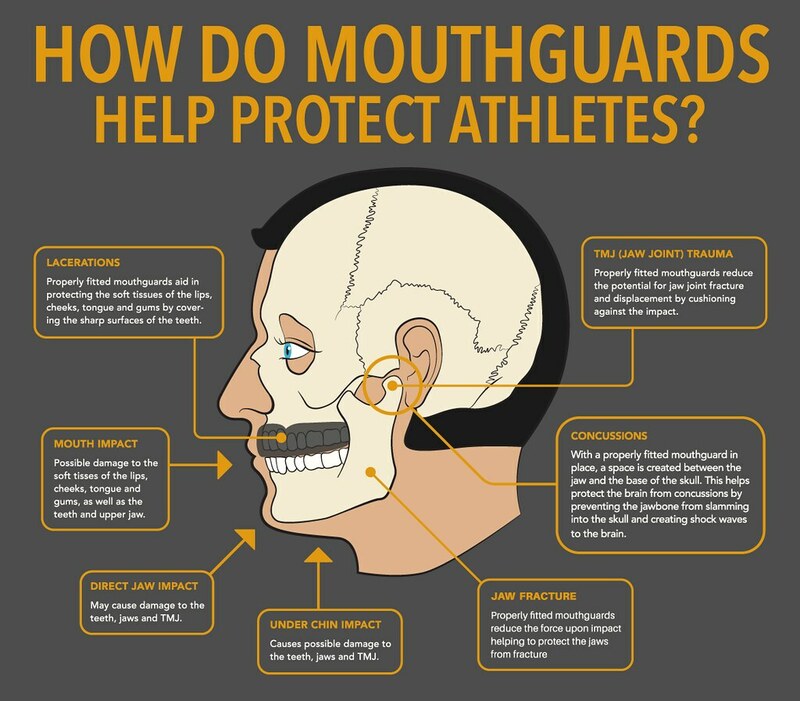 Mouthguards are usually made of a soft material that absorbs the impact and protects the mouth against physical contact. They usually cover the upper teeth, tongue, lips, jaws, and cheek lining. Since the upper teeth are more prominent, they are more susceptible to damage from trauma. Stock: For a generic mouthguard, stock mouthguards offer basic protection. These mouthguards are mass produced and widely available if you need a last-minute solution. However, they are pre-formed, so they may not fit well and can be bulky in the mouth. Boil and bite: This mouthguard offers a DIY custom fit for kids to mold at home. Boil and bite mouthguards are first softened in boiling water and then inserted in the mouth. They will adapt to the shape of the mouth, resulting in a much more comfortable fit than stock mouthguards. Custom-made: The pediatric dentist can personally create a custom-made mouthguard for patients. This is the best but most expensive option. Because they are professionally molded to the mouth, these mouthguards are much more comfortable and strong than anything you can buy in-store. Most sports teams will provide protective equipment or notify parents if they need to purchase it, but not all leagues are as strict with their safety protocol. Many youth leagues are more lax with their rules, but being safe is always better than being sorry! If your child is involved with any of the following sports, consider getting a mouthguard. Of course, these are just a few sports that may require mouthguards. There are many more that we haven’t listed. After childhood, it’s even more pertinent that patients use protective gear because a lost permanent tooth will not grow back. We recommend teens and adults involved with physical contact sports invest in custom mouthguards, especially if they have braces.